This tab displays various metrics detailing the amount of bandwidth that PageSpeed Service serves on behalf of your project. 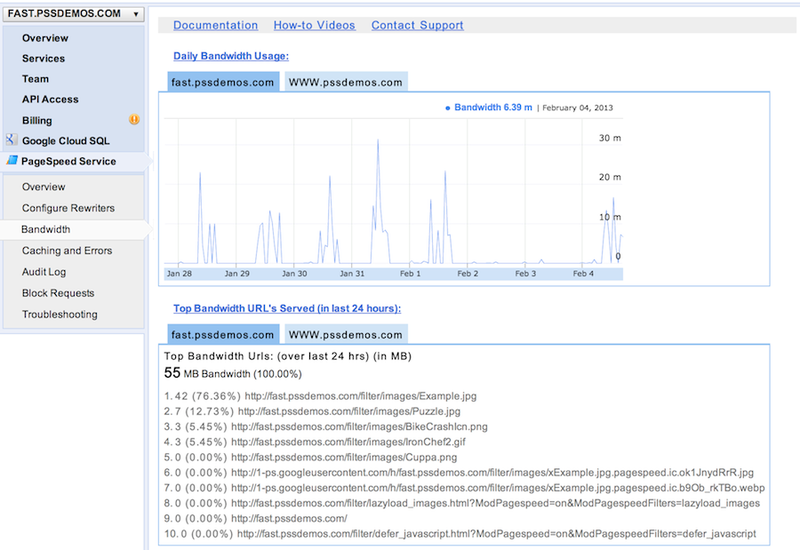 You can access it by logging into the Google APIs Console, and selecting the Bandwidth menu under PageSpeed Service. This plot displays the amount of bandwidth that PageSpeed Service served for your website per day over the last 30 days. Please note that the bandwidth displayed in this chart represents bandwidth served from PageSpeed Service's servers to your website's visitors. This number will differ from the bandwidth charged by your hosting providers, which corresponds to bandwidth served from your origin server to PageSpeed Service's servers. If your bandwidth consumption looks higher than expected, please consult the Top Bandwidth URLs chart below to understand which resources are consuming the most bandwidth. This table lists the top URLs served by PSS, sorted by bandwidth over the last 24h. The bandwidth values are displayed in Megabytes. The number, in parentheses, represents the proportion of bandwidth over the last 24h that the URL consumed. Note: The URL table may not add up to 100%, since your domain may serve more resources than can be shown in this table.